NATURE'S CHOICE - Hortiland Holland B.V. The natural way of growing! 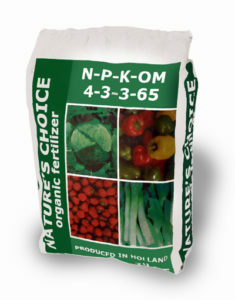 Nature’s Choice is a first class organic fertilizer. It is a pure natural product with a high percentage of effective organic matter. A 100 % organic pellet that contributes to soil conservation and is extremely suitable for Integrated Agriculture. Nature’s Choice improves the biological activity in your soil. This stimulates the production of your crop. and enhances capillary rise to the rooting zone. Choice creates a nutrient buffer which reduces nutrient and trace element deficiencies. Its pelletized form makes it suitable for all kinds of application. Homogeneous distribution is possible at low labour costs. Nature’s Choice is packed in easy to handle 25 kg bags. It does not lose quality in dry storage for several years. The product also contains a large number of trace elements, including Mn, B, Mo, Fe, and Zn.